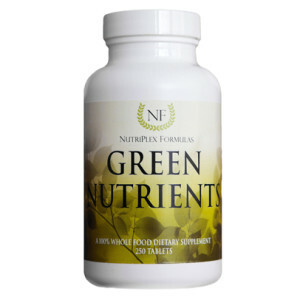 Providing the alkaline minerals needed by every organ and cell in the body, Green Nutrients supports acid-alkaline balances and contains a host of nutrients found in green vegetables. Effects of too much acidity may include the following: poor hormonal functions, tooth decay, infections, kidney and other organ problems, weight gain, aching and inflamed joints, generalized inflammation, and more. Excellent for pliability of the musculoskeletal system and other structures, healthy blood sugar levels, and respiratory structures. Adds important green vegetables & more to the daily diet! Inactive Ingredients: Cellulose, Croscarmellose Sodium and Silica. In addition to the unique properties, synergists and cofactors of this food, each serving provides the following nutrients contained within the above food-nutrient blend (not as isolates): Vitamins A, B, C, E, F and K; Potassium; Calcium; Manganese; Protein; Iron; Folate; Chlorophyll; Flavonoids (Kaempherol); Choline; Copper; Zinc; Selenium; Sulforaphane; Lutein; Iodine; Zea-Xanthin; and Phosphorus. One of the most discussed factors regarding raw, green foods is their ability to promote systemic alkalinity. Many researchers agree that acidosis accounts for many symptoms and diseases, including problems with joints and the musculoskeletal system, in general. In addition, the green foods found in Green Nutrients are especially important in support of the hormonal system of both males and females. Today’s modern diet is severely lacking in raw, green vegetables, carrying important minerals and vitamins to support a wide array of biochemical functions. Spinach, broccoli, parsley, dandelion and the cereal grasses in this vegetarian formula are excellent sources of minerals, chlorophyll and other nutrients. The potassium in these foods, in particular, are essential for the cellular energy and function needed for all cellular activity on a systemic level.